Matgrass is a slow-growing perennial bunchgrass, with tufts reaching 3 feet across or more. Leaves are grasslike, up to ¼ inch wide but appearing narrower because blades are tightly folded along themidrib. The blade spreads at nearly a right angle to the stem. The ligule is short and membranous; auricles are lacking. Stems grow up to 8 inches tall and are tipped by inconspicuous slender spikes that emerge in midsummer and bear all spikelets on one side of the stem. Spikelets are tiny and straw colored and tipped by short, straight awns. Tufts are tightly rooted and hard to remove. IMatgrass (Nardus stricta) is native to Eastern Europe. It reproduces mostly through transport of tufts in mud clinging to the hooves of grazing animals. It is a coarse-textured grass that is not palatable to most livestock, and it eliminates other vegetation within each dense tuft. 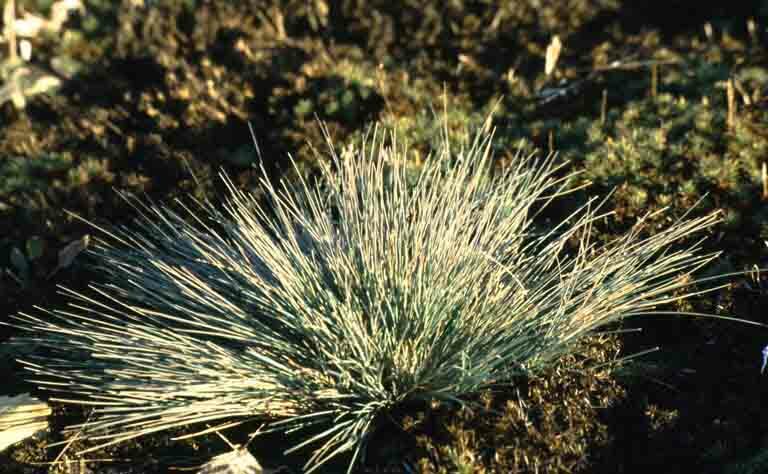 Matgrass is generally found in seasonally saturated mountain meadows.